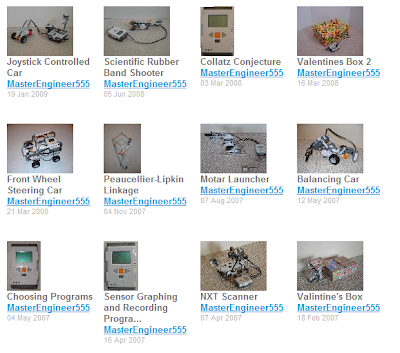 Lego has a website where you can post your Mindstorms NXT projects and I've put up a couple. Here's the direct link to my projects. Another way to see mine is to click on the link of my username, MasterEngineer555. This will bring you to the projects of that user. So if you don't have the above link, go to the website, search my username, and click on it (other people have mentioned me and my projects, so more than just my projects will come up in the search). I won't write about these projects here since they've already been posted elsewhere, but I'll write about new ones of course.